Lately, I have been making many flying geese and I thought that I would share with you the method that I use to make accurate flying geese. You can click on the images to supersize them to see more detail. 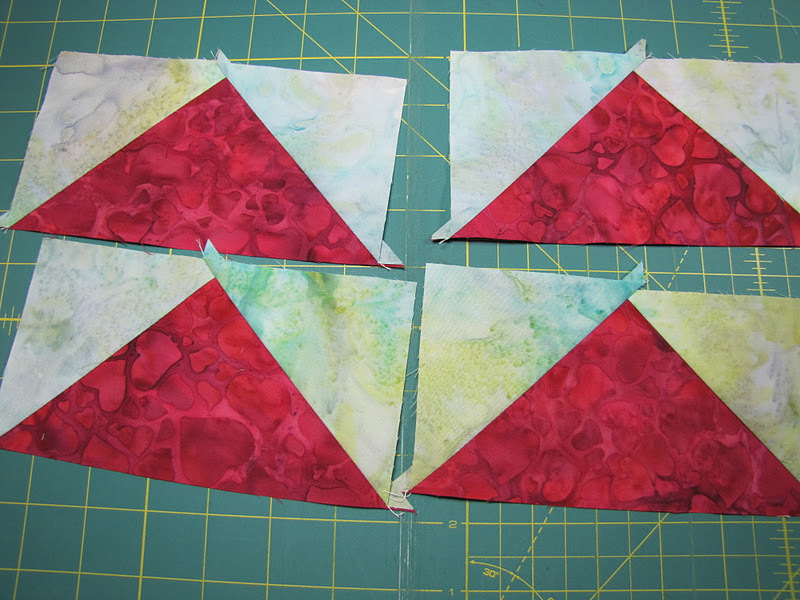 This tutorial will yield 4 - 3.5" X 6.5" unfinished flying geese. 1. Cut 4 small squares, at 4" square. These are the background. 2. Cut 1 large square, at 7.5" square. This makes the geese. Layer 2 small squares in the corners of the large square, right sides together. Aligning the corners carefully. Take your Magic Wand Tool (you can find it here) on the diagonal and then draw two lines on either side. It will look like the above. Or you can draw one line down the center from corner to corner. Pin the squares in place on either side of the lines. Now sew directly on the line on one side. Turn it around and then sew down the opposite side. Your block will look like this. You may want to press it now so it lays flat. Then take a ruler and cut it directly down the middle between the stitching lines for a perfect 1/4" seam. Press the small background squares open so that the seams are pressed towards the small squares. 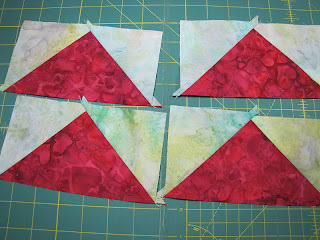 Now take the remaining 2 small squares and place them in the lower corner of the geese fabric. Right sides together. Aligning the corners carefully. Take your Magic Wand Tool (you can find it here) and place it on the diagonal into the corners of the small square. Draw two lines on either side of the magic wand. Pin the small square on either side of the lines. Sew directly on the line on one side. Turn block around and sew down the opposite side directly on the line. It will now look like this, you may want to give it a press so it is laying flat. Take your ruler and cut it on the diagonal between the 2 stitched lines. Your pieces will look like the above. 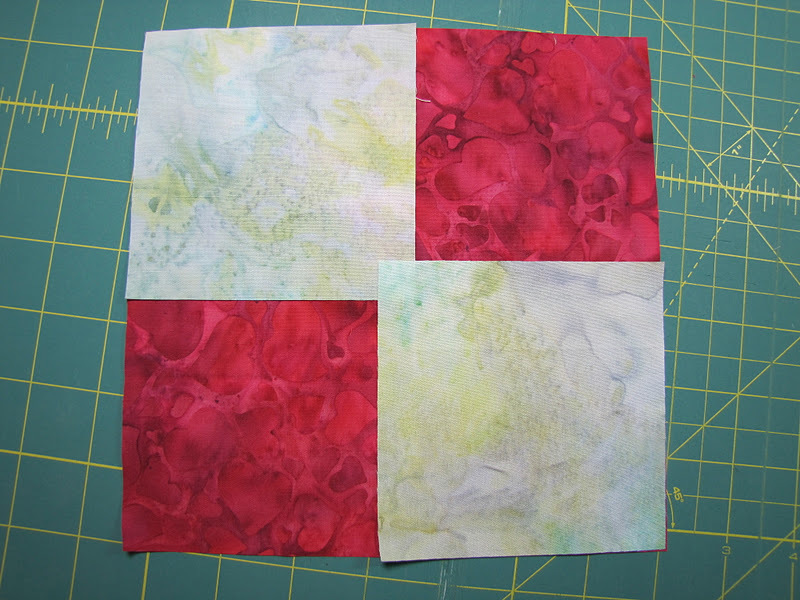 Take all four pieces and press the background fabric open so that the seams are pressed towards the background fabric. You now have four flying geese that are not quite complete. They will need a tiny amount of trimming. Take the Wing Clipper Tool (you can find it here) and align it with the correct dimensions and trim the right and top sides. As you can see there is very little waste. You now have 4 very accurate 6.5 X 3.5 inch flying geese. The nice thing about trimming down instead of trying to get the correct dimensions on the first try is that you ALWAYS have the size that you need and it is accurate. The Wing Clipper Tool allows you to accurately cut flying geese from as small a 1/2" X 1" up to 5" X 10". You can find both the Magic Wand and Wing Clipper Tools in my shop along with some companion patterns as well. Just click here. 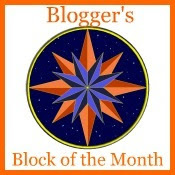 Don't forget to return here on the 25th to get Block number 3 of the Blogger's Block of the Month! I prefer this method. No waste... I see you use your magic wand. that is the best tool for Flying geese! this is how I made mine last time I did Flying Geese. I borrowed your tutorial for our local handicraft-organisation. My origianlly plan was to make a tutorial after one of this autumns courses - your tutorial was much better than I could have made it! I do hope it is ok for you that your tutorial can be used here in the western part of Norway! Cool! Thanks for sharing this! This is the first time I've seen a method without leftover triangles. I don't get to sew much right now, but have made a note of this for the next time I'm sewing geese. Excellent method (well-explained!) ... if Santa doesn't bring me one of those Wing Clipper thingies I am going to be very disappointed. Great idea to use, as you call it, the Magic Wand tool. I use this method also, but draw a diagonal line and sew on each side. I like your idea! I was going to write the same type of tutorial. Thanks for saving me time! I also enjoyed the article about you in "Canton Life", I hope you show it on your blog. I wish you continued success Jackie. This is such a cool way to create flying geese. Thanks for sharing Jackie! This looks like a great way to make these. I'd never seen either of these tools. Thank you. This is my favorite method too. I love the no waste! Lynne's Liberated Letters Tutorial is LIVE! Waterfront Park layer cake quilt complete! Is The Flying Pigeon a Raleigh Copy? I'm baaaack, Hope you haven't forgotten me! Home Again, Home Again! Jiggity Jig! Finish Number Two and Muffins! Welcome to my "Ultimate" Family History Organizing System. Incredibly Easy (and tasty) Risotto in 15 minutes! I'M Back after a long stay away thanks to cancer! Sale! 25% Off Entire Shop! 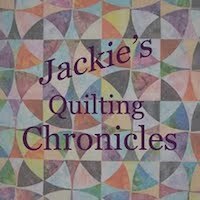 The Hollyhock Quilts Blog Has Moved! Flannel Yellow Girls Coin Quilt - Done!! Sew and Sox now on Etsy! Welcome to little acorns blog! My Quilts and Other Projects....Check Them Out!! This is a Flickr badge showing items in a set called My Quilts and Projects. Make your own badge here.